Sometimes, God tells us to SHUT UP! Well, you know He tells us to be quiet! Has it ever happened to you? 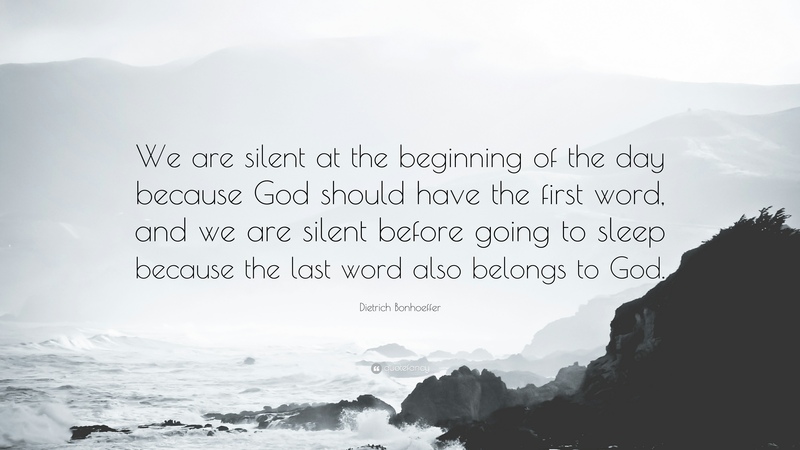 My first encounter with this, I was in prayer when I heard God’s command: “Silence!”. I was shocked, but I was also struck with amazement. It made me laugh because I felt embarrassed at God’s rebuke, and feeling His sincere love all at once. God cannot speak if we are constantly talking. We cannot hear Him, if our minds and mouths are in constant chatter. Silence, I have learn is golden! I’ve learned to worship God in silence. It’s just the way He has taught me to reverence Him, and although there are many forms of worship- my silence to God is precious. In being quiet, throughout the years I have learned to calm my anxious mind, and to search my weary heart. I’ve also learned that God is a detailed God, when it comes time to worship Him: sometimes He expects praise, and shouts and other times He wants silence and homage, while other times He just wants me to lay at His feet. In the bible, Mary Magdalene’s tears were worship for the Lord while dancing close to naked was David’s form of worship. It may sound strange to those who do not have intimacy with God, but it the way He deals with me specifically. In this season of my life, for the past few months God has taught me to be silent. And to keep myself in retreat. It’s pretty funny, because I’m a very energetic person with strong and vivacious opinions! I also think a lot, and wonder many things and visualize a lot. So for me, God knows it is sacrifice- a surrendering of myself. And it is why He receives it as worship, it goes against my nature. After a few dilemmas in my own life, I’ve observed that He looks to build an intimate bond like that of marriage. We keep each other’s secrets, as it should be in any relationship. Speaking to my youth, about prayer: we always touch on the fact that our minds wander and we can be easily distracted. I’ve concluded that everything comes up when we are ready to pray! We get distracted, by a day dream, or we get sleepy. We get hungry, this falls, someone calls your phone, the neighbor’s kids start crying, the police car drives by with the sirens blazing! The enemy knows that all He has to do, is take our attention away from God. Today, I want to encourage you to practice stillness in the presence of God. Declaration: I declare that even if I’m tired, hungry, overwhelmed or fed up I will push past it to focus on God. I will not be distracted, and if I am I will present the distractions to God so He can search my heart and show me where they come from. I declare I will practice stillness before God, because He deserves my reverence. And I will do this as an act of faith, showing Him I am willing to wait on Him. Lord God thank you for your word, and the many forms of prayer and worship included there. I present to you, all the anxious hearts and minds, I ask you to fill them with grace to stand in your presence naked. That there be no pretentious thoughts, or signs of copying anyone else; that their spiritual lives may be genuine in every way. In Jesus name, Amen.